V: So how did you spend your day? Jigsaw: Playing a game..... V:Oh, was it Monoply? V: So what do you do for fun? Jigsaw: I put on a strange mask and screw with five people. What do you do? V: I put on a mask and screw with about a million people. Jigsaw: *swoons at V *. could I be your best friend?? Anon: So how did you spend your day? 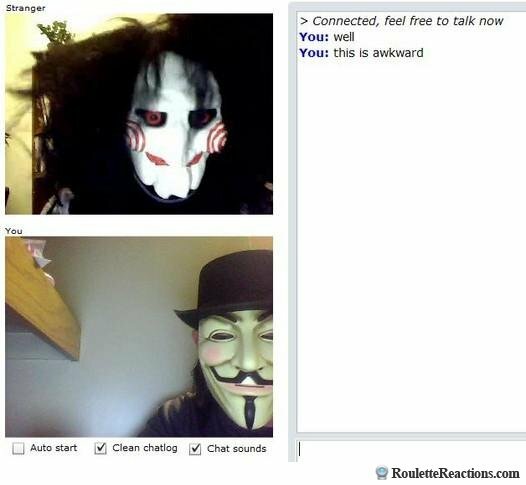 Jigsaw: Playing a game..... Anon:Oh, was it THE GAME? THIS.. THIS MAKES ME SO HAPPY. "Jigsaw:hey V,if you move from the chair,an axe will fall over your head" "V:and if you move from yours,you're gonna blow" "Jigsaw:..." "V:..."
It's funny because its not even Jigsaw. That's Billy doll you fucks. What is brown and salty? A pretzel.